Risk tolerance: How much can you afford to lose? What do you stand to gain? How much money goes into each investment bucket depends on your risk tolerance, financially and emotionally. Timeframe: Another issue is when you want something to happen. 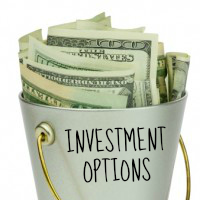 The investment bucket that your money goes into depends on when you plan to retire, or whether you want to use investing as a way to reach a short-term goal. Into this bucket goes the portion of your portfolio that you want kept as secure as possible. These are FDIC-insured products, like high-yield savings accounts and CDs. You won’t earn a great deal of interest on cash, but it will be safe, and fairly liquid (make sure that you have some of your cash bucket in savings accounts, since the CDs aren’t as liquid without penalties). Use your cash bucket for things like your emergency fund, or for money that you know you are going to need at a specific time. You can use a CD ladder approach if you want to know that money will be available at regular intervals, but still want to try to maximize returns. Are you looking to produce regular income? If you want your investments to contribute to your cash flow, the income bucket is the way to go. It takes time to build up a good revenue stream from income investments, so be prepared to take between 10 and 20 years to fill this bucket. You can use bonds and dividend stocks, as well as P2P loans (if you have the risk tolerance), to put together an income portfolio that makes sense for you. This is about building your nest egg. It’s about portfolio growth, often for the really long haul. This is the money that you invest in retirement accounts, and that you don’t plan to touch for 20 to 40 years. This is a bucket where the asset allocation is likely to change as you get older and closer to retirement, and shift from the accumulation stage to the shoring up stage. If you are planning a medium-term goal, such as sending your child to college, or saving up to buy a house (goals that take between three and 10 years), you can create a bucket for that. Carefully consider how to balance reasonable growth with some level of security for your money. Using an online discount brokerage can be a good way to build up for your medium-term goals. Do you have short-term goals you want to reach? Dreams that you want to see become reality in the next one to two years? This is the bucket for you. You can use an online discount brokerage, or even use tools like the Betterment gift registry to reach your goals. Putting a certain amount toward your short-term goals can help you reach them faster, and you can even use social strategies to get help from your friends and family. How are you planning to invest your money? Leave a comment! This article was originally published December 21, 2012.